The texts in the above screenshot are rendered with the text layer. The template used is from BixPack 5. What can I do with the text layer? 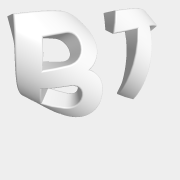 With the text layer you can create 3D texts. How do I create a text layer? Choose LAYER > Add layer > Add text layer... to create a new text layer. Choose LAYER > Attach layer > Attach text to active layer... to attach a new text layer to the active layer. The new text layer can be selected from the layers dropdown to make it the active layer. The installer comes with shows demonstrating the possibilities of the text layer. Choose FILE > Open show... and select a show from the BluffTitler/Media/Shows/Text folder. Choose MEDIA > Change font... to change the font. Choose MEDIA > Change texture... to change the texture. Choose EFFECT > Change effect... to change the effect. Use the 1st layer style dropdown to change the composition. This example uses String 2. Use the 3rd layer style dropdown to set the text style. Borders on the inside are created by attaching a text layer using one of the Outline styles to a text layer using the Inside style. Select the style with the 3rd dropdown below the textbox. Easiest way to add a border on the inside is to click on the Attach border to active layer... button (or choose LAYER > Attach layer > Attach border to active layer...) and select one of the bevel presets. 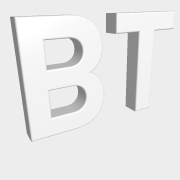 Set the size of the border with the Bevel property of the parent layer. Borders on the outside are created by attaching a text layer using the Stroked style to a text layer using the Solid style. Select the style with the 3rd dropdown below the textbox. Easiest way to add a border on the outside is to click on the Attach border to active layer... button (or choose LAYER > Attach layer > Attach border to active layer...) and select one of the stroke presets. Set the size of the border with the Stroke property of the attached layer. 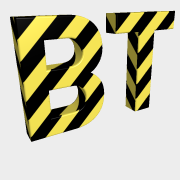 In the Effects/Text folder your can find effects specifically designed for the text layer. This example uses the Text/DancingFool effect. Every line starts at the same horizontal position. Every line starts at the same horizontal position. All lines are centred. Every line ends at the same horizontal position. Every line ends at the same horizontal position. All lines are centred. Every line is centred. This is the default effect. All lines are scaled to the same width. All characters use the same space. The first line is drawn in a circle. In combination with the text rotation this creates a nice merry-go-round effect. The characters follow the path of a sinus wave. The 3rd slider of the Spacing property controls the phase. The first line is drawn as a spiral. The lines are placed on a roll. The characters of the first line are walking a tight rope. The 3rd slider of the Spacing property controls the elasticity of the string. The back of the text is invisible in this style. Fonts look depressingly 2D in this style. 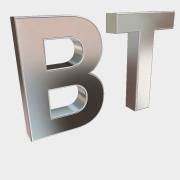 Fonts are extruded along the edges to create solid 3D objects. Use the bevel effect to create fonts with eased edges. This gives the font a very smooth round shape. This adds a border to the outside of the text. With the Stroke property you can adjust the size (1st slider) and depth (2nd slider) of the border. This does the same as Stroked sharp, only with rounded corners. This effect renders each character as a solid block. Set the margin with the Bevel property. This effect looks like the font has been cut out of a solid block. Set the margin with the Bevel property. The outline is drawn as a tube. Use the Bevel property to adjust the radius of the tube. The text is rendered as a wireframe model. The text is blown up. Use the 3rd slider of the Text size property to make the effect more subtle. The text is a balloon. The text is rotated around the vertical axis. You can use the Revolved Angle property to set the amount of rotation. The 2nd slider controls the rotation offset. The 3th slider controls the radius. The text is rotated around the horizontal axis. You can use the Revolved Angle property to set the amount of rotation. The 2nd slider controls the rotation offset. The 3th slider controls the radius. Turns every character into a convex shape. Use the Stroke property to blow up the shape. Only renders the holes (counters). Adds 2D light discs to the text to create a marquee effect. 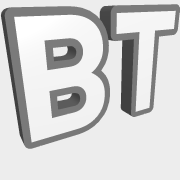 Adds 3D light bulbs (spheres) to the text to create a marquee effect. Turns your text into a comb. Adds spikes to the text. Adds hairs to the text. Decorates the text with sequins. Decorates the text with small diamonds. Extends the outlines at sharp edges. Add rectangles to the font ends that can be textured with nice ornaments. Make sure the ornaments start at the centre of the texture. Cuts the text into slices in the XY plane. Use the Slice properties to control the effect. 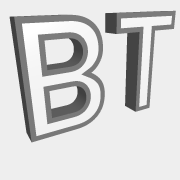 Cuts the text into slices in the Z plane. Use the Slice properties to control the effect. Renders the text as rectangular plateaus. Use the Slice properties to control the effect. Renders the text as round plateaus. Use the Slice properties to control the effect. Use the Pixel Size property to control the size of the pixels. Use the 2nd slider of the Pixel Size property to control the size of the individual triangles, cubes, hexagons, cylinders, spheres and bubbles. This style can be used in combination with the Outline Flat style to create a flat text with a border. This style can be used in combination with one of the outline effects to create a text with a border. This style can be used in combination with the Outline Sphered style to create a sphered text with a border. Only the outline is drawn. 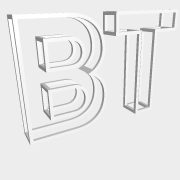 Use the Bevel property to set the size of the outline. These effects are commonly used in combination with the Inside style to create texts with borders. The position of the text: horizontal, vertical and depth. The rotation of the text: heading, pitch and roll. The point around which the text rotates when animating the Text rotation property. Press F2 to visualise the pivot point. The rotation of the individual characters: heading, pitch and roll. The font size. Notice that the All keys checkbox is automatically marked when you select this property. This way the font size of all keyframes is adjusted. Unmark this checkbox when you want to animate the font size. 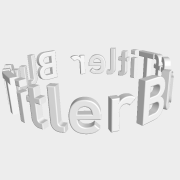 With this property you can stretch the text in all 3 dimensions. This way you can create thick, thin, deep or wide characters. The size of the individual characters. The diffuse text colour: red, green and blue. Note that the light colours also affects the appearance of the text: for example a red text illuminated with a green light will appear black. For most textures you want to use a white colour. Press <F3> for the standard colour dialog. The colour used for specular highlights. If this property is (0,0,0), the diffuse colour is used as the specular colour. 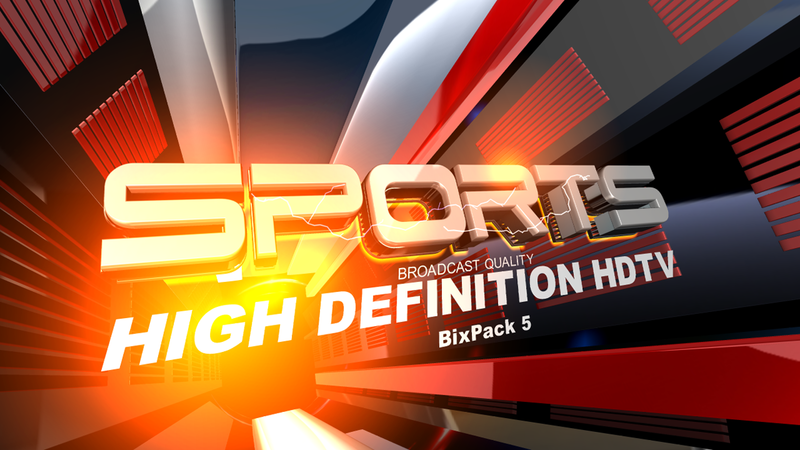 The size of the specular highlights. The transparency of the text. 0 is opaque, 1 is fully transparent. The 1st slider controls the distance between the characters (letterspacing or tracking). The 2nd slider controls the distance between the lines (linespacing or leading). The 3rd slider is only used by the Wave and String compositions. The width of the space character (wordspacing). Some character pairs like AV, 69, AT and // can be put closer to each other than their rectangular bounding boxes would allow them. 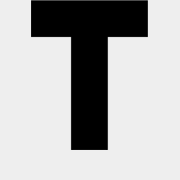 This makes the text italic by shearing it. Doing this procedurally is also called faux, fake or false italic. The true way is to use the italic version of the font in the MEDIA > Change font... dialog. However, not all fonts offer an italic version. Each succeeding character is rotated a little bit further. This property is used by the Stroke and Convex hull styles. It controls the size (1st slider) and depth (2nd slider) of the stroke. The 1st slider controls the thickness of the bevel. The 2nd slider controls the outer height. The 3rd slider controls the inner height. Creating bevels is an expensive operation, so it is best not to animate the bevel size. Notice that some fonts have small details that could intersect extreme bevels. With this property you can simulate a type writer. A value of 0 means that no characters are being drawn, 0.5 means only the first half are drawn and a value of 1 draws everything. The 2nd slider controls the start position. With this property you can make the characters behave as if they are attached to each other by springs. The 1st slider controls the delay in seconds of the slowest character. This is also the time you have to extend the duration of the show in order to give all the characters enough time to reach their destination. The 2nd slider controls the pickup point, 0 means the first character and 1 the last character. If the 3rd slider is greater than 0, every character has its own random delay. If the 3rd slider is -1, the text is split into words instead of characters. If the 3rd slider is less than -1, the order of the words is random. The 1st slider sets the number, the 2nd slider the minimum number of digits and the 3rd slider the number of decimals. The number is rendered when you use the <counter /> tag in the textbox. If this property is set to 1, every A is turned into a B. If this property is set to 2, every A is turned into a C.
The first slider controls the size of the emoji characters. The second slider its vertical position and the third its depth position. The position of the texture. The size of the texture. The way the texture is mapped. 0 is box, 1 is planar. The difference can be seen at the sides of the texts. This property is only used by the Slices, Straight slices and Round slices styles. The 1st slider controls the height of the slices, the 2nd the distance between the slices and the 3rd the position of the 1st slice. This property is only used by the Slices, Straight slices and Round slices styles. The 1st slider controls the rotation of the slices. This property is only used by the Pixel styles and controls the size of the pixels. This property is used by the Light discs, Light bulbs, Comb, Spikes, Hairy, Sequinned, Diamonds, Extended outlines and Ornaments styles. A higher density means more decorations. This property is used by the Light Discs, Light Bulbs, Comb, Spikes, Hairy, Sequinned, Diamonds, Extended Outlines and Ornaments styles and controls the sizes and positions of the decorations. The exact behaviour depends on the selected effect. This property is only used with the Revolved styles. Use this property to create some chaos. The 1st slider adjusts the positions of the individual characters, the 2nd the rotation and the 3rd the random seed. 3rd slider has special meaning when using a negative value: range[-5.5, -6.5> only displaces the horizontal position, range[-4.5, -5.5> only displaces the vertical position and the range[-2.5, -3.5> only displaces depth position. With this property you can explode the text. The 1st slider controls the translation, the 2nd the rotation. Notice that you can use the edit boxes next to the sliders to enter values out of range for the sliders. You can use this to make the text explode completely out of the screen. This property is only used in the EPS layer. It controls the number of times the EPS shape is rendered. The 2nd slider controls the number of lines. With this property you can define the maximum size of the text. If the text is bigger it will be scaled to fit. This is very useful when using the show as a template or for dynamic content. This property can be used to solve sorting problems. Transparent layers have to be sorted according to their distance to the camera. This sometimes goes wrong when using very big, very small or irregular shaped layers. When this happens, use the Depth bias property to fix it.